Rotany querns for milling grain were probably introduced into the British Isles during the Roman period. 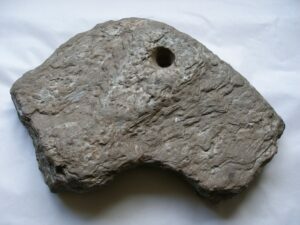 The upper stone had a circular hole at the centre through which the grain was introduced, and one or two shallow holes on the top surface to accommodate wooden handles. 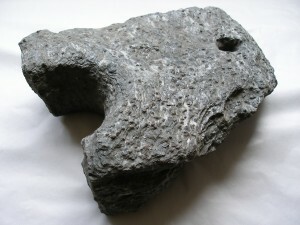 An intact upper stone with four holes is built into the garden wall of the old manse on Lismore. 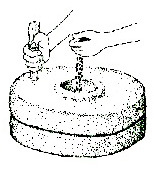 Rotary querns were still in use on Lismore in the 17th century to produce oatmeal at home. In the Second Statistical Account, the parish minister recorded a very late use of a domestic quern in Kingairloch in the 1830s. He had “never tasted better oatmeal than that which it produced”. In 1618 Dougall MacDuncan MhicPrior, tenant in Baleveolan was fined 40 shillings at the baron court “for having of curines for grinding of cornis agains the actis of court” and in 1628, Gilchrist MacCowell Mhic Ewen and Ewen MacLechrist MhicCowll were also prosecuted. The landlord, Sir Duncan Campbell of Glenorchy, pursued his tenants because they were “thirled” to the water-powered mills on the estate; this meant that they had to grind their oats at the mill, pay a proportion of the grain that was milled (multure), and contribute to the upkeep of the mill. Trouble was always simmering between miller and tenants: in 1641, Archibald MacGillivray, miller in Achnacroish brought all the tenants to court for “refuseing to pay the ordinar milne dewtie and also for refuseing to doe yr s[e]rvice to the milne conforme to vse & wont”. They were found guilty and sentenced “in tyme cuming to pay ane pek [peck] dry corne out of ilk iij bollis [each 3 bolls] dryed corne. And the milne rigne [mill roof] and his meat [the miller’s food] as vse wes of before [as formerly]. As also to mend repair and thak [thatch] the s[ai]d milne [mill] And to be all vther s[e]rvices y’rto [thereto] vsit & wont vnder the paine of ane vnlaw to be imposit on the falzein at the Lairds discretion [under the pain of a fine to be imposed on the defaulter at the Lord’s discretion]. The tradition is that, across Scotland, landlords forced their tenants to use their mills by destroying querns. These fragments may well be the result of such destruction. The first (object 18) was found by the late James MacCormick, Killandist, on Achanard township, and the second (object 19) is said to have been found on Baligrundle. A series of intact querns is on permanent display in the museum. Court Book of Disher and Toyer. National Archives of Scotland. GD112/17/4, 5 and 6.